We have new inventory arriving all the time! Please call or email if you have any questions or are looking for something that you don't see. Edward Almeida #341 ~ Preowned Price: $7,950 This beautiful Almeida Flute is a fine hand-crafted instrument with a gorgeous, rich sound. Edward Almeida is an intrinsic part of the historical legacy of Boston Flutemaking. He apprenticed with Verne Q. Powell beginning in 1948 and was emp..
Altus 1507 #6102 List Price: $7,950 This expertly crafted Altus flute features a sweet and lyrical sound. This silver flute has soldered tone holes, a split E mechanism, and a D# Roller. Sterling Silver headjoint, body, and mechanism Soldered Tone Holes Offset G ..
Ewen McDougall Custom #30 ~ Preowned Price: $7,950.00 This beautiful McDougall Flute is a fine hand-crafted instrument with a gorgeous, rich sound. Ewen McDougall is an intrinsic part of the historical legacy of British Flutemaking. He apprenticed with Rudall Carte beginning in 1950 an..
Brannen Sterling Silver Custom #1385 ~ Preowned Listing Price: $9,950 This Brannen is an excellent custom Flute! This Flute has been meticulously maintained and has been recently overhauled! Sterling silver body and mechanism Soldered tone holes .016 wall tubing Inl..
Brannen 10k Gold #8482 ~ Preowned Listing price: $24,500 This 10k Brannen is an excellent custom Flute with a 14k gold Lafin headjoint! Made in June of 2017, this Flute is in pristine condition and is worth almost $30,000 new! 10K Gold Body LaFin 14k headjoint with Platinum riser..
Haynes Commercial #26195 ~ Preowned Listing Price ~ $2,495.00 This Commercial model Flute by Wm. S. Haynes is an all-silver instrument that boasts a beautiful, strong sound and has a C# trill! With drawn tone holes, a low C foot and an offset G, this is a great instrument for a f..
Haynes Commercial #22256 ~ Preowned Listing Price ~ $2,195.00 This Commercial model Flute by Wm. S. Haynes is an all-silver instrument that boasts a beautiful, strong sound. 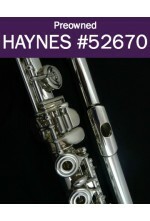 With soldered tone holes, a low C foot and an offset G, this is a great instrument for a fantastic pr..
Haynes Custom #44020 List Price: $4,500 This expertly crafted Haynes flute features its signature sweet and lyrical sound. This flute has a silver headjoint, silver body, soldered tone holes, and a convertible low C/B footjoint. Sterling Silver Headjoint, body..
Haynes 14K Gold Custom #52670 ~ Preowned Crafted in 2009, this flute is a fine example of the Wm. S. Haynes artistry. With a 14K gold body and sterling silver keys, this custom flute features a beautiful, warm sound. 14K Gold Body with Sterling Silver Keys Body only - pair it..
Miyazawa Boston Classic #75535 Listing Price: $10,500.00 This flute is a beautiful example of Miyazawa craftsmanship. It is a joy to play, with a beautilful, lilting sound, an even scale and responsive low range. This flute new is over $21,000! Boston Cla..
Miyazawa Elite #103356 Listing Price: $10,995.00 This flute is a stunning example of Miyazawa craftsmanship with all the bells and whistles. It is a joy to play, with a beautifully lilting sound, an even scale, and a responsive low range. This flute new is almost..
Miyazawa 202 #88913 ~ Preowned Listing Price: $3,350 A gorgeous Miyazawa 202 flute featuring a 958 silver headjoint and an offset G! A perfect flute for the intermediate player at an affordable price! .958 Silver headjoint Silverplated body Silverplated mec..